So, I'm not much of a gamer these days. In fact, I've reduced the games I do play on my phone. The games I do like, need to capture my attention, but let me put it down after only a bit of time (I don't have copious amounts of time to play games) - but then have something to keep me coming back. 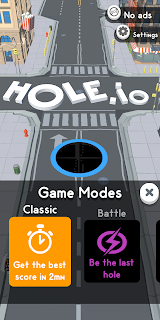 hole.io is similar, but a little more graphically inclined. The premise is that you play with like 7 others players (tho', mind you, you can play without internet, so I'm guessing that it's using some game engine to play for them) and you all start off as a tiny little black hole. It's fun, just on that level ... nom nom nom. The competitive edge is that you're trying to see who can eat more than the others and eat each other (the double whammy, as it prevents them from eating for 5 seconds and you get a whack of points). The higher you are after the 2 minutes is up, the more points you get. The more points you get, the more 'stars' you have, which I think lets you maneuver around faster. That's one mode of gameplay. 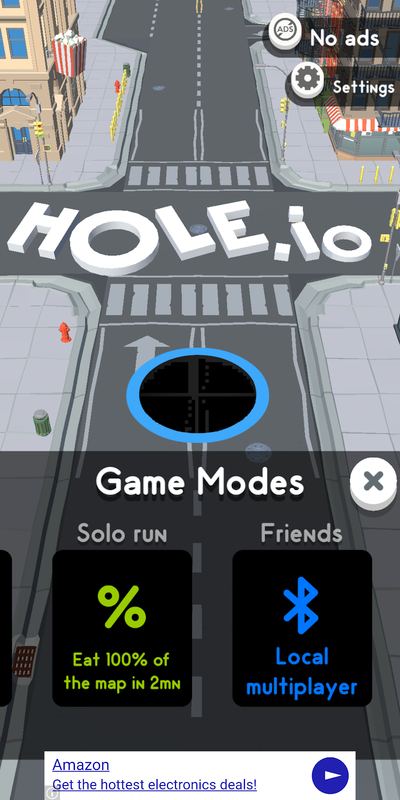 You can play 'solo' and see how big you can get in 2 minutes for a personal best. You can also play 'last standing' ... where instead of a timer ... just try to be the last hole around (not get eaten). It's ad-supported, so there's a video usually after every round, and a display ad at the bottom of the screen ... it's annoying, but you can get rid of it - but it's $5.49CDN ... which is a bit rich for my blood. Maybe if I keep playing for a few more weeks, maybe I'll shell out.